Goal: To share God’s blessing with as many people as possible in 24 hours through the tradition of Epiphany House blessings. Goal: To visit parishioners in their homes for a brief but lovely and elegant occasion, sharing their home life and building a stronger community of faith. Goal: To enroll a different group of volunteers than the normal and usual ones. Goal: To be introduced to non-parishioners in neighborhoods where our people live through a non-threatening and deeply peace-filled and joyous rite. 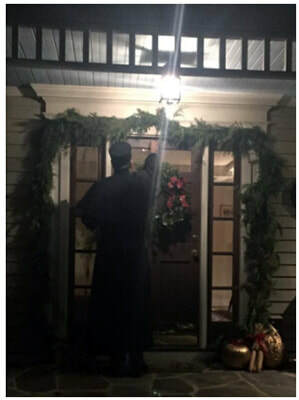 Goal: To give our parishioners a comfortable and fun means of telling their faith story to others through an invitation to the house blessing marathon. Goal: To wrap up the Christmas celebrations with a high-energy event that moves the community forward into the Epiphany Season and warm the winter months with a reminder of God’s presence: Christus Mansionem Benedicat! 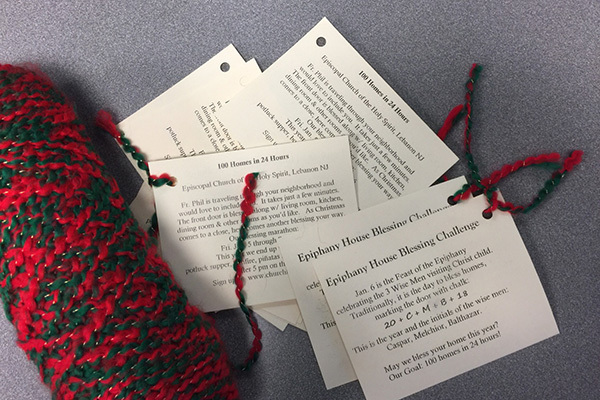 What is the Epiphany House Blessing Challenge (HBC) 2018? 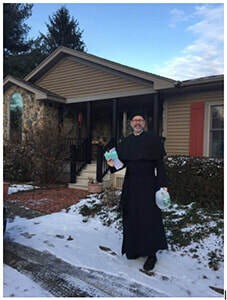 Organizing as many homes as can be blessed in 24 hours as possible, given the unique situation of each participating parish. Each parish will try to best that record in succeeding years. If shared, the results will be posted on these pages. The current baseline record for Episcopal Church of the Holy Spirit, held by the Rev. Philip B. Carr-Jones, is 64 homes, 2 barns, 2 horses, 40 chickens and coop, 50 Barbie Dolls, and a brewery. 137 miles traveled. 12 drivers recruited. Our faith communities across the country are blessedly different. Set your own challenge and have fun besting it. Let us know how it went. Send in your stories. We'll keep a final tally for our first year across the country. Perhaps next year we'll set up some friendly diocesan challenges. It's all about blessing and less about the numbers anyway. Have joy! 8 of the 64 homes were non-members. 3 new families (now very active) joined the parish as a direct result of the house blessing challenge - 2 of those families simply because they heard about us doing it from others!!!. The wider community knows of this curious and charming event and interest builds for the next year. Parishioners are more comfortable talking to their neighbors about what their church is doing to advance the Kingdom of God. Announce in Advent. Announcement follows below. Our first year was organized and announced on Advent 2 It took very little effort to pull this together and the enthusiasm within the parish was very high. From that ratio then, this is a huge win for the community. Christmas Eve services are a perfect occasion to invite folks. Especially lapsed, under-active and new visitors. A sign up slip inserted into the bulletin to be dropped in the offering is another way to get good enrollment. A Google Doc sign up easy and free to construct and share link in newsletter, email blasts,and in Sunday bulletins. A physical map (remember those) can still be had, and affixed to white core board and small colored locater map pins left out so people on Sunday can locate their homes. A paper sign up sheet left nearby. Be sure to ask for cell phones, landlines, any curious directions needs- as some GSP instructions will be wrong. Sign up also can include willingness to be a driver. We had too many that wanted to help in a way, so just have back ups. More on drivers below. Organize routes in the way that makes sense for your situation. Our area is in a wide ex-urban county so we made our routes by compass quadrants NE, NW, SW, SE. It might make better sense to run in ever widening spiral, or for that matter beginning a route furthest out and traveling back to the Church. Mapquest was very helpful as it automatically programs the shortest most efficient route when entering addresses. Decide ahead of time the overall plan of travel, quadrants or spirals, before entering data. You cannot give a choice to your parishioners about timing. This is a tough one. Keep it simple. Announce which quadrant you are blessing and when. We did it in four, four hour chunks of time (Friday: 4pm to 8 pm and 8 pm to late night; Saturday: 8am to noon and noon to when it is done) It will be impossible to bounce around upon the convenience of the individual. And will make scheduling nutty. You can always go back throughout the season of Epiphany and pick up those folks out of town or unavailable a certain time and day. 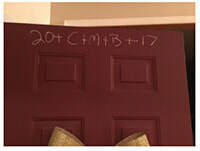 Even so, your arrival at a home must be thought of as handling a service call or appliance delivery. You provide a window of arrival time. Note too, this is a fun opportunity as you can blog in real time where you are and what’s happening between homes you’ve just blessed. People on your route can monitor your progress which is fun for families with children. As you begin one house blessing, the driver would be calling ahead to the next home to advise them of your arrival in due time. You might desire to have a blow out pot luck dinner party Saturday night of Epiphany as you complete your route back to the church. Maybe even a useless gift exchange, as well as a collection for some good cause. Perhaps thinking of fun thanks gifts to hand out to the drivers. Situla: One gallon water jug with small opening on top made to fit aspergillum. Will need half gallon depending on how enthusiastic you spray God’s grace. Open church situlas spill too easily. Be flexible, for Christ’s sake: If another neighbor suddenly wants a blessing, be prepared to offer it! We wound up blessing both sides of whole street. This is a great time to go with as many vestments as possible as it is often really cold.